Escape to this very picturesque and rare private valley retreat between Paso Robles and Cambria on Californiaâs scenic Central Coast. With coastal climate influence, rainfall averages 35+ inches per year. 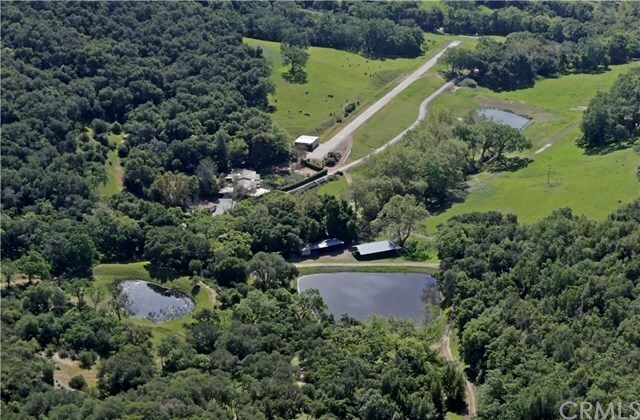 This 514.80 +/- acre ranch features grassy meadows, three ponds, a seasonal creek and acres of wooded hillsides. Located in the York Mountain wine region called York Mountain AVA. The property boasts a 4500 +/- sf. main residence with 3 bedrooms, 4 bathrooms and a downstairs bonus room/exercise room with dumbwaiter & sauna. Also included are two detached guest suites with private bathrooms and 1820 +/- sf. caretaker residence with 3 bedrooms and 2 baths. Other amenities include a redwood hay barn, work sheds, feed/equipment sheds, aircraft hangar and a small non-permitted and 1500 +/- ft. paved landing strip. With eight legal certificates of compliance, this property would be an ideal corporate retreat or private family compound.